Duke's Jahlil Okafor is drawing rave reviews -- how about the rest of the 2015 class? If there is one sure thing in the crop of 2015 NBA draft prospects, it’s powerful Duke freshman Jahlil Okafor. League executives describe the 18-year-old center as “the complete package,” “a total stud” and “the best center prospect since Dwight Howard," who was drafted out of high school in 2004. Indeed, it should be an interesting next few months leading into a draft that is expected to include the usual group of freshmen in addition to several upperclassmen and an intriguing array of international prospects. League executives salivate over pure centers like Okafor, who combines prototypical size and length (7-foot-5 wingspan) with polished skills. 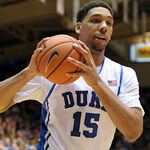 Okafor can score inside and out, and he is a solid defender with the physical tools to become a better one. Okafor played well in a matchup with Wisconsin senior Frank Kaminsky, overpowering one of college basketball’s best bigs in the post. It’s early, but it’s going to take a lot to knock Okafor out of the top spot. Towns is another tantalizing two-way big man. He's long (7-3 wingspan) and mobile with a body type similar to that of former Wildcat Anthony Davis. Towns has shown devastating shot-blocking skills (2.6 blocks in just 18.6 minutes per game), and scouts believe he can develop into a reliable offensive option. Kentucky's depth will camouflage some of Towns' talent, and his limited playing time will depress his numbers (the 19-year-old is averaging 9.4 points and 7.1 rebounds). 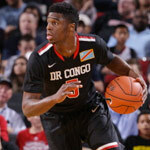 Mudiay, who signed a one-year, $1.2 million deal with the Guangdong Tigers out of high school after committing to hometown SMU over Kansas and Kentucky, is easily the draft’s best playmaking prospect. With great size, superior athleticism and precocious passing instincts, Mudiay is a nightmare in transition. An ankle injury has left the teen in limbo, though, as the Tigers signed longtime NBA guard Will Bynum last week to fill in for Mudiay. Still, Mudiay has put up solid numbers in China, averaging 18.9 points, 6.6 rebounds and 6.3 assists in his first nine games. Opinions vary on this spot, but pencil in Johnson, a physical specimen who already defends at an NBA level. Johnson’s offensive skills are far less advanced, especially his outside shooting. Scouts believe he can develop into a powerful off-the-dribble threat, though. Talent evaluators cringe at swingmen who are not skilled on the perimeter, so the 18-year-old Johnson will have to prove to be reliable. If he can, he’s a terrific small forward prospect. Last June, several executives picking in the second half of the first round winced when Porzingis withdrew from the draft; now you know why. Porzingis is an excellent stretch-four prospect who runs the floor well and has tremendous shot-blocking potential. He needs to bulk up and improve his off-the-dribble game, the latter of which he is getting more opportunities to hone this season (Porzingis is averaging 21.2 minutes with Sevilla in the Spanish ACB, up from 15.2 last season). Looney, 18, was an outstanding rebounder and shot blocker in high school and came to UCLA with a versatile offensive game. The rebounding and shot blocking have carried over, but the Bruins are still waiting to see the diverse offense. While Looney is averaging 14.1 points, 11.2 rebounds and 1.9 blocks, he has yet to establish himself as a perimeter threat. The physically gifted Winslow projects to be a plus NBA defender. He is a capable rebounder with a high motor but possesses a mediocre offensive skill set. 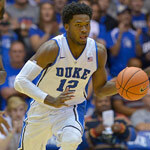 Winslow, 18, has been decent from three-point range (10-of-26, 38.5 percent), but his perimeter game is a weakness. This is a prospect who could inch up a few spots or drop five or 10. Turner, a quality rebounder and shot blocker, is still trying to find his way offensively. His 11-of-12 performance against St. Francis (Pa.) matched a school record for highest single-game shooting percentage, but he struggled in marquee matchups against UConn (1-of-4) and Kentucky (1-for-5). Scouts consider him a project, albeit one with a big upside. Hezonja won’t put up eye-popping numbers this season; he is averaging only 12.2 minutes for Barcelona. But Hezonja has impressed scouts with his ability to score inside and out. He can be a little reckless with the ball, an area that could get better as he matures. Cauley-Stein, 21, a Big Board fixture last season whose return to Kentucky surprised many executives, is a known commodity. He defends, rebounds and runs the floor but is limited offensively. Still, Cauley-Stein is shooting 62.3 percent and has raised his free throw shooting to 63.0 percent after connecting on just 48.2 percent last season. Russell is a dynamic guard who is shooting 46.2 percent from the field and 42.5 percent from three-point range. He also has a nice feel for the pick-and-roll -- which enthuses scouts and has helped him average 5.3 assists -- and chooses from a variety of moves off the dribble. Scouts will be watching to see if the 18-year-old can develop into a full-time playmaker. Alexander is undersized for his position but compensates with a 7-2 wingspan and a willingness to mix it up with bigger players. His offense lacks polish, and scouts have noted subpar performances against the Jayhawks' two ranked opponents, Kentucky (2-for-7) and Michigan State (1-of-5). Still, a bruising big man like Alexander, 19, is someone to watch. Harrell, 20, another surprise returnee to college, is off to a strong start, converting 64.1 percent from the field and getting to the free throw line nearly seven times per game. 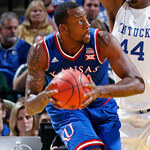 If Harrell wants to prove that he can play some small forward in the NBA, he will have to improve his outside shooting. Two scouts were alarmed at how poorly Kaminsky defended Okafor in their matchup last month. Kaminsky, 21, is shining on the other end, though, shooting career highs of 54.5 percent from the field and 43.8 percent (14-of-32) from beyond the arc to solidify his appeal as a floor-spacing big man. The fluid big man boasts a wealth physical tools, including a 7-3 wingspan. The fast-rising McCullough, 19, has a high ceiling defensively, while offensively he thrives in transition. He needs to add bulk and sharpen his skills in the half court. Oubre is a top-10 talent, with length, athleticism and a plethora of offensive moves. But he has been a nonfactor in his first seven games, averaging only 8.3 minutes and shooting 38.5 percent. Scouts are optimistic that the 19-year-old will overcome the struggles and work his way into Jayhawks coach Bill Self’s rotation. After improving significantly as a sophomore, LeVert is taking another leap by hitting 23-of-47 three-pointers (48.9 percent) and raising his scoring average to 17.7 points from 12.9. LeVert, 20, can create off the dribble and is an excellent passer. He has to continue to add strength, but LeVert has the potential to rise up the board quickly. Dekker was regarded as a possible lottery pick before the season, but his three-point shooting (7-of-24, 29.2 percent) is down again early this season and scouts are wondering what happened to the freshman who made 39.1 percent. Dekker, 20, is a versatile wing who can score, but he has to rediscover his deep touch to bolster his stock. There are plenty of things Hollis-Jefferson, 19, does well. He’s athletic, scores in the paint, rebounds well for his position and passes competently. What he doesn’t do well is shoot from the outside. Hollis-Jefferson is 3-of-10 from three-point range after going 2-for-10 as a freshman. Kentucky’s depth makes it tough to get a read on its players' pro potential. Johnson is a productive rebounder (6.7 in 19.0 minutes) and a decent passer from the high post. He’s automatic around the rim and shows flashes of a post game, adding up to 63.8 percent shooting. He’s a project, but his combination of size and strength are attractive. If the 19-year-old adds a dependable post move or two before the end of the season, he could climb higher.